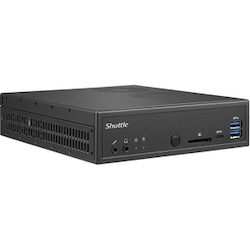 Geared towards large and high-resolution signage application, the Shuttle XPC DH270 XPC slim, is based on the IntelH270 chipset, supports LGA 1151 Intel6th/7th generation Core i 65W processors. With integrated Intel HD graphics, the DH270 can support 4K/UHD video playback on up to three screens via three HDMI outputs. In addition it supports DDR4-2133/2400 memory, as well as Intel Optane technology improve on processing and data transfer speed and agility. The DH270 provides multiple I/O and high-speed storage interfaces, including USB 2.0, USB 3.0, SATA 6Gbps, RS232/422/485, M.2 type M and A/E, and Mini PCIe. Thanks to Shuttle's exclusive heat-pipe cooling with smart fan, the DH270 is capable of long-term operation at high stability and reliability levels Its slim 43mm design and VESA support to makes it easy to integrate in diverse commercial environments.